For the price, this is a rather good deal on a quality set of cookware. 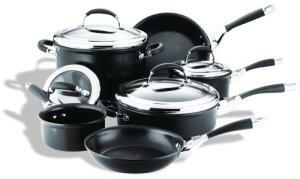 Circulon pioneered the concept of hard-anodized nonstick aluminum cookware over twenty years ago. A feature you will quickly notice is the texturing inside the pots and pans; rather than smooth it is comprised of outward radiating raised rings. This is known as the Total Hi-Low Food Release System and functions as an additional barrier against food sticking to the surface of the pan. Also, according to the manufacturer it helps prevent damage to the nonstick finish by limiting the contact with utensils that could otherwise scratch the surface. Either way, they got it right, for they claim that it will outlast all nonstick finishes. Circulon backs that up with a guarantee. This cookware has stainless steel and silicone handles for comfort and that includes the glass lids. One thing I really like is the balance of polished stainless steel with the tempered glass of the lids. They appear much sturdier and rather more elegant than some, and should coordinate well into any modern kitchen scheme. The cookware and lids are oven safe to 400 degrees F. Cleaning should not be a challenge as the outside is nonstick as well, although you may find stubborn foods cling to those rings from time to time. A limited lifetime warranty accompanies this cookware set.